Now that it’s a new year, it’s time to consider your strategy for training and how you can keep your existing qualifications up to date. Within the current WHS legislation there is a general obligation for everyone in the workplace, with a major emphasis on employers, to act with due diligence. This basically translates to the care that a reasonable person must exercise to avoid harm to others in the workplace. It’s a pretty open-ended term placing obligations on everyone while they are at work, including employers, the self- employed and employees with the general requirement to carry out their duties. As responsible operators it is also a requirement for everyone to receive training for their roles and to be deemed competent and current in their required skills. One way to demonstrate compliance with these requirements is to attend regular training and update sessions to maintain and improve skill levels. Regular refresher and update training and assessment programs to suit relevant skills are offered by Training For Trees. Once a unit of competency or full qualification is attained, attending refreshers and update sessions is a good way to ensure qualifications are kept up to date with the latest requirements. This is an effective way to ensure bad habits are identified and rectified with further training. Plus, there are some major financial incentives from the government at the moment for employing new apprentices or training existing workers to full qualification level. Contact the Training For Trees office for further information. Do I Need A Ticket To Operate A Pole Saw? 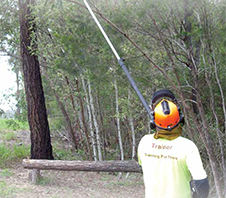 A common machine used on a regular basis in the tree industry but often overlooked when it comes to training and certification is the powered pole saw. We are often asked, ‘Is a ticket required for a pole saw?’ If an available unit of competency relates to a particular operation or machine then it is reasonable to recommend that training and assessment is undertaken as nationally recognised proof of training skills and competency. Along with these injuries, tree damage from rips and tears and incorrect pruning angles can also occur without proper training for pole saws. Despite the risks, these machines are a great asset to have in any arborist toolkit. They seem to be getting plenty of use in the storm clean-up operation as they can distance the operator from the hazard and allow users to cut hanging branches into small, more manageable sections. 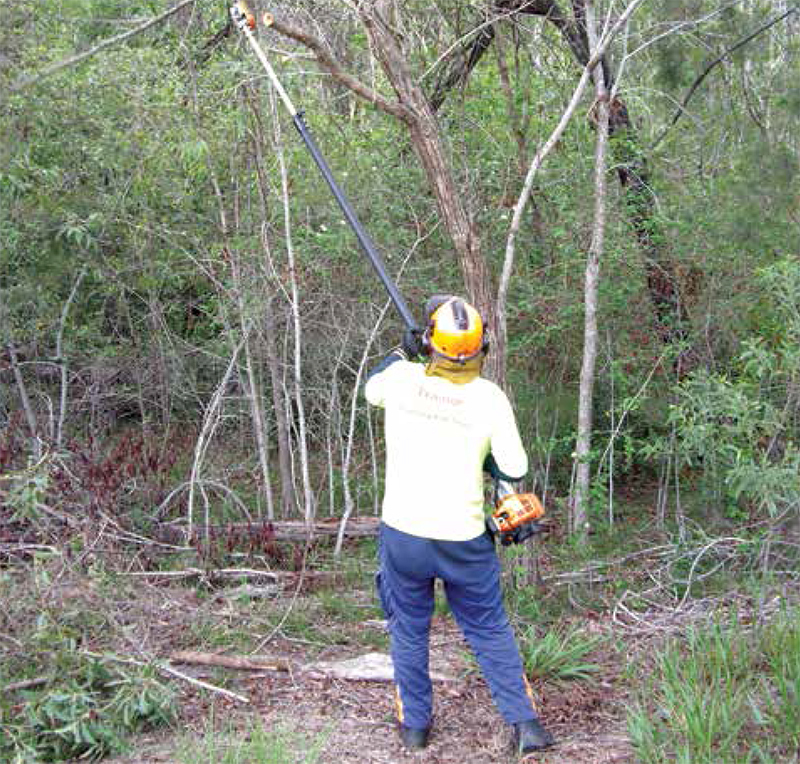 The early pole saws were essentially a small chainsaw head available as an attachment for the end of a brushcutter and didn’t have many safety features and refinements. This initial concept is unchanged to date; you can still buy multi-purpose machines that interchange with various implements. However, safety features are now standard and clearly identified in the operator manual as well as on the warning decals on the machine. Guide bar and chain designs have been refined with the bar having a narrow nose and gauge combined with a reduced kickback chain.The power unit’s drive shafts have user-friendly systems built-in to reduce vibration through the operator’s hands and arms, although the main drive shaft tube can be subject to a fair amount of vibration in some machines. There are some excellent support harnesses available for the larger machines that support the weight and load of the machine while still allowing full reach and functionality. These are similar to a rucksack in design and are more substantial than the basic shoulder strap that comes as standard. They reduce the classic neck and shoulder strain that can happen with prolonged use. Machines are available with two- or four-stroke power units, plug in electrical, and even in rechargeable battery- powered forms. The most popular machines in our industry are the extendable high reach types. Over the years there have been some nasty accidents caused by severed branches falling on the operator or innocent bystanders and contact with overhead power lines. One thing I notice that is increasingly alarming is the lack of respect and maintenance of these machines. They all too often appear dirty with illegible warning stickers and a poorly maintained bar and chain. Maintenance of the bar and chain is the same as for the conventional chainsaw, just ensure you use the correct chain tension file size and stick to the correct filing angles as per the chain manufacturer’s recommendations. As with all operations that are carried out in the workplace it is essential to carry out a risk assessment on site before any work commences. The control measures should include taking note of any worksite issues, emergency procedures, the surroundings, exclusion zones, public access roads and any other issues that may rise during the assessment. There should be an agreed upon plan of operation and, most importantly, communicate this to all personnel on site. At this stage I would also strongly recommend the tree is taken into consideration. Can the proposed operation be carried out cleanly with the pole saw without causing tree damage? Or, should the tree be accessed without the pole saw, utilising the skills of an experienced arborist and pruned in the conventional fashion? 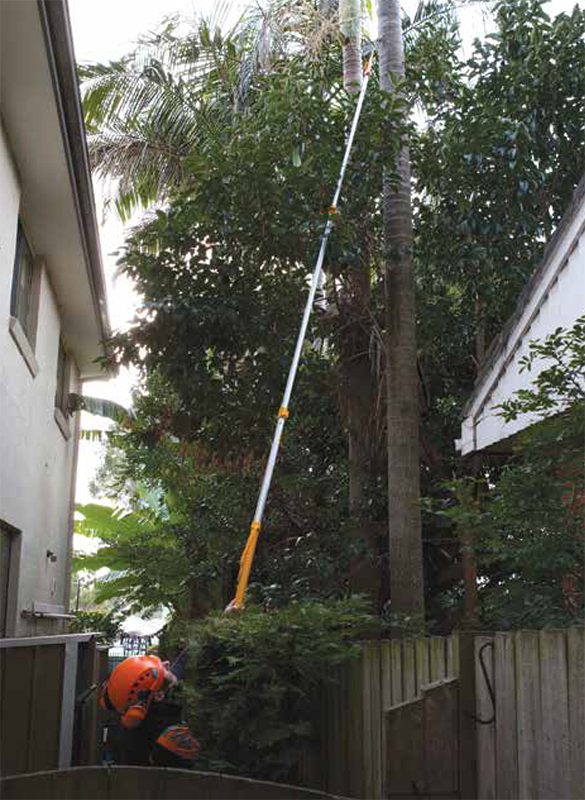 Due to the nature of a fast-cutting attachment on the end of a 4m pole, the pole saw has a tendency to be a little difficult to control at full stretch. 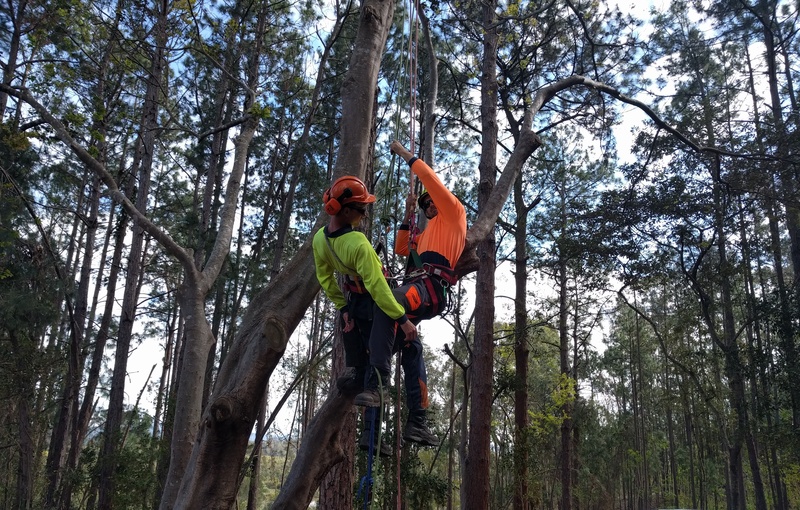 Achieving the final pruning cuts in accordance with industry- best practice, and the Australian standard for tree work, is not always possible. The result of poor planning and operation can cause a lot of unnecessary damage to the tree. This damage generally takes the form of scars along the branches, coat hanger-like stubs, large flush cuts or wrongly angled branch collar pruning wounds. A lot of irreversible damage can be done to trees in a very short space of time and operators must be trained in their maintenance and operation along with some sound arboricultural knowledge and training to reflect the requirement of the pruning standards (AS4373 Pruning Of Amenity Trees). As well as risk to the tree, there is also risk to the operator, who in some cases finds the best operating position directly under the branch that is being cut! The operator then finds that gravity works faster in a downward motion than they can move sideways carrying a 10kg machine above head height, with the resulting impact normally ending in a trip to the emergency room. In general these machines are not insulated and unless you have the correct training and certification to work around electrical apparatus then stay well away from overhead power lines. If in doubt call the local power supply company for advice. Don’t forget that the primary task powered pole saws are intended for is the removal of lateral branches. It is almost impossible to make a correct pruning cut on upright growth and these normally result in a spear cut which will not be able to compartmentalise correctly. It may also be useful to consider having a manually-powered pole saw, such as a Silky Saw, for use in conjunction with the engine-powered machine as this will allow for better positioning on some of the internal cuts made around the canopy. If these steps are followed you should find greater operational efficiency and less downtime/damage to your investment and therefore more money on your bottom line. Q: Do pole saw operators need a ticket? A: WHS states employers and the self- employed at work must be adequately trained in their duties. A nationally recognised statement of attainment such as FPICOT3238B Operate a Pole Saw is one of the ways to document that approved training and assessment has been carried out. We recommend the unit AHCPGD203A Prune Shrubs and Small Trees is carried out in conjunction with the pole saw unit, as a minimum. Persons that are trained and certificated generally have a greater understanding of operations and the required outcomes. The end result is usually seen in less downtime and maintenance requirements and ultimately in the reduction of accidents and injuries. Training is as important as the servicing of vehicles and machinery, after all, workers are the machinery required to operate your business. It has been proven that independent training and assessment increases staff retention, safety, awareness, productivity and efficiency. Remember to schedule regular refresher and update training sessions. For full trade level qualifications and apprenticeships to meet the industry standard requirement to be classified as an arborist/tree worker you will need to undertake AHC20513 Certificate II in Arboriculture which is a good pathway to follow towards becoming a qualified working arborist, and undertake the AHC30810 Certificate III in Arboriculture. Funding incentives currently apply to eligible applicants and their employers in QLD. Check out your eligibility for funding. Enrol now for Certificate II and III in Arboriculture. Chainsaw (all levels), First Aid, Working At Heights, and AC/DC are now booking. Contact Training For Trees for your short course RPL or refresher training needs. Visit www.trainingfortrees.com.au or email info@trainingfortrees.com.au for details.